Ah, Moonbeam. It’s so cute. And so goofy. That’s why it’s so neat. I like Moonbeam. Moonbeam is a small francophone town of about 1000 (which is big compared to places like Mattice, let alone Harty!) It is so clean, so well kept, and, well, so spunky. From what I’ve been told, the town got its name from railway workers who insisted that a beam of light from the moon hit the tracks one night. And thus Moonbeam was named. And with the help of hippies and a few dedicated locals, the name stuck. Moonbeam loves its space theme. 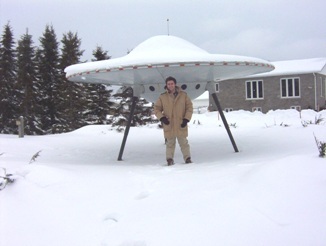 The flying saucer is one of Highway 11’s most famous monuments and is known throughout Ontario. There is the Blue Moon Motel and Chip Stand (motel + chip truck = awesome combo) which features space stuff on its signs. Moonbeam has its own mascot which is a little green alien whose name I can’t remember. He’s on all their signs which are all over Highway 11’s eastern portion. I think I even have him on a shirt pin. But it’s not all rockets and asteroids with Moonbeam. They have a vision and they’re realizing it. There’s the Centre Culturel and the Leonard Art Gallery. The town has some of the best hiking, cycling, and walking trails in northeastern Ontario. Moonbeam has its own snowmobile club with trails that are groomed in the winter (it’s the first place I’ve ever seen a snowmobile trail groomer.) Just north of town there is Remi Lake and René Brunelle Provincial Park, which I’m told has a waterslide. There is also fishing, swimming, and canoeing/kayaking. Moonbeam’s most famous son would be sculptor Maurice Gaudreault. Gaudreault is well-known within Canadian ceramic circles for his work depicting life in northern Ontario through clay. There’s also a short film called Leaving Moonbeam about a young girl trying to hitch a ride out of Moonbeam. Moonbeam actually has a fair amount to do and is totally worth a stop, or even more so, an actual visit. This entry was posted in The Interior and tagged big weird things, francophone, provincial parks by Highway11.ca Editor. Bookmark the permalink. My grandmother (Soucie) ran the hotel in Moonbeam around 1940′s and apparently Al Capone used to hide out there during his notorious activities. I read a book called Moonbeam during my time at St. Jerome College in 1960 but can’t find a copy of it. Would love to get it. Born in Moonbeam in 1951, lived there for 5 years , then moved to Val Albert and started school there.. moved away when I was 20 but visit my family every year, wether they like it or not . Planning on spending more time there now that I’m retired. Great Post! The mascot’s name is KILO ! And also, Della Pieta Restaurant is still open (and they make great Pizza) I was born and raised in Moonbeam and I can safely say that there is no better place on earth to grow up. We don’t spend a lot of time inside… In winter, the outdoor skating rink is always full and so is our small Ski Hill (which is run by volunteers!). 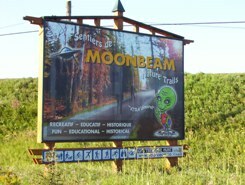 Moonbeam’s Nature Trail system is one of the nicest in the province and links the town to Remi Lake. In the summer, we all flock to Remi Lake (6km North of Moonbeam) where René Brunelle Provincial Park is with its sandy beaches. There’s good fishing and swimming on that lake. There’s always something going on in Moonbeam… it’s a village (we call it ‘Le village’) that’s alive, full of great people. I so agree with you. Lived there until age 20, moved away for studies, traveled the world and saw wonders. Somehow, Moonbeam is way up there as my favourite place. 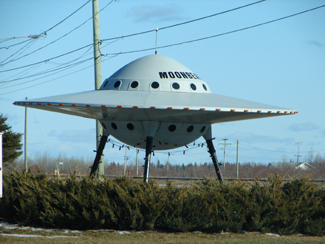 From what I have heard over the years MOONBEAM is a LOT MORE notorious for UFO sightings than any website lets on. Apparently almost every person who lives there has seen UFOs on more than one occasion. It is the CANADIAN equivolent to Roswell NM. And what’s-up with your own private TUNGUNSKA??? April 17 the date the comments on the old site were imported to the new format. Locals know about the massive area of flattened trees near MOONBEAM. It is the WORLD’S LARGEST CROP CIRCLE except that insted of crops having been flattened by something that landed then took off… An entire FOREST was flattened. Please, local yokels, post some photos!!! Just got back from that area today!!!! Ihad my camera with me! but too many people taking pics with the flying saucer. next time hopefully!!!!! The town has sure changed since the 90′s. La bienvenue hotel burned down years back…. the Potvin furniture store is closed…. the old gas station on the corner is also gone. Even at the Bay Ouellette is changed since i was there…. (when i was a kid) :)…. Della pieta restaurant is closed also …. The town has changed but the people remains the same!!!! friendly, courteous. My family is from Moonbeam, and I have many, many fond memories of summers spent there! Love Moonbeam! I was born and raised in that little town of Fauquier and now live near San Diego Ca., and when I went back home for my dad\’s funeral (Glorien St-Amour) I was very surprised to see a very nice looking space ship. I loved it! Thanks Moonbeam for putting it on. The Tragically Hip mentions Moonbeam in a song called Fly in there new album World Container.